It was an ugly day here yesterday -- it rained all day long with lots of heavy wind gusts and it was chilly, too. We got about 3+ inches of rain here yesterday and they say more is on the way for today and tomorrow so we are under flood watches. I got up early and ran a few errands yesterday morning but it was so chilly here (about 50 degrees) that I couldn't wait to get back home and get warmed up. Youngest son came for dinner last night so I made a big chicken and veggie stir fry. 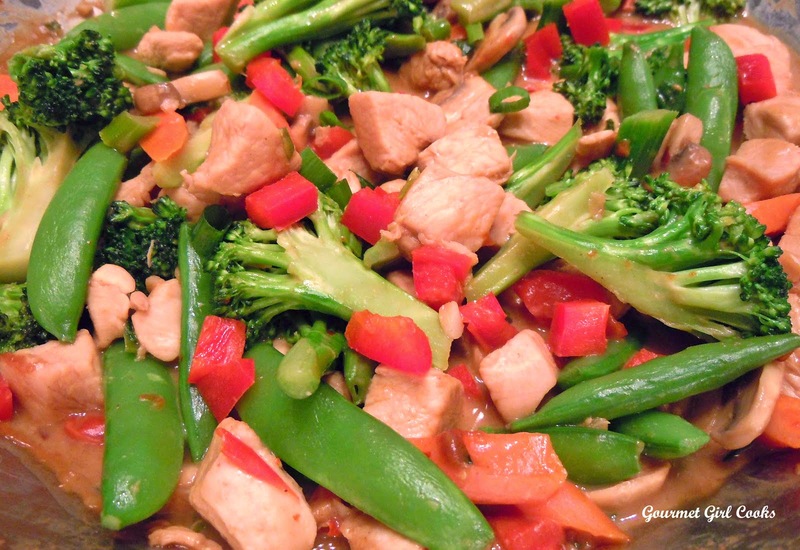 I stir fried diced boneless chicken breast in some coconut oil and then added: fresh broccoli florets, sliced carrots, fresh sugar snap peas, diced red bell pepper, sliced green onions, minced garlic, and fresh sliced mushrooms. I steamed the broccoli, carrots and sugar snap peas for about 3 minutes in about 1/3 cup of water in the microwave to soften them slightly before stir-frying them. I made a quick and easy sauce by making a well in the center of my wok (pushing all the chicken and veggies toward the outer part of my wok and adding a few tablespoons of peanut butter and stirring it until melted, then adding about 1 cup of chicken stock, a few tablespoons of tamari sauce (in place of soy sauce), and then adjusted for seasoning and thickness -- I added a tiny bit of more peanut butter and then I seasoned with red pepper flakes, ground cayenne pepper, and a little Celtic salt. When it was just the way I wanted it, I tossed everything together to coat with the sauce. Hubby and son ate theirs over brown rice and I had mine as is, topped with some roasted almonds. It was really delicious! I'm going to get out and run my errands this morning while we are briefly in between storm systems. Since I fell asleep on the sofa before posting it last night, I am posting a couple photos below this morning. Enjoy! What a great idea serving it with roasted almonds. Much tastier than rice! And what a nice sauce, too! Hi CyberSis -- I really enjoyed it with the almonds and truly did not miss the rice whatsoever! The sauce is super simple and you can make it as thick or thin as you like -- its amazing how nicely peanut butter thickens it. Hi GG, the dish looks beautiful but you only produce colorful recipes. I have a question about the sauce, do you cook it *away*,( I am embarrassed about the phrasing, English is my 3rd acquired Language) or is there quite a bit left? You added 1 cup of broth! Thank you GG. I hope that you are enjoying better weather! Be well! Barbara from California.